Rap music has elevated the office of “pimp” to something glamorous and worthy of respect. The myth remains, but perhaps it is evolving. Hustle & Flow, the Audience Award winner from Sundance, is finally seeing the light of projectors. It tells of a very small-time Memphis pimp and his desperate fight to do something more important with his life. Some have even called it a mid-life crisis movie. Pimpin’ ain’t easy. It ain’t fulfilling for DJay either. Terrence Dashon Howard (Crash) plays DJay. He’s almost got the right look for a proud pimp, but he can’t quite afford the polish. He runs one girl, Nola (Taryn Manning), from his Ford LTD with custom wheels and chrome hubcaps, but the driver’s side fender came from a different-colored car. Skinny Black (Ludacris) was a friend of his from way back. He’s gone on to fortune and fame in the rap game. Another old friend, Key (Anthony Anderson), is a sound engineer who’s most glamorous assignment is a church choir. Usually, he records court depositions or school recitals. Putting two and two together, DJay decides to try his hand at rap. With his experience hustling, Skinny Black’s connections, and Key’s expertise at recording, he thinks he can rise above the hot, cheap, meaningless life he has. 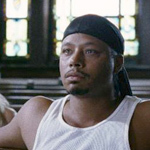 While Hustle & Flow didn’t make a huge impression on me, I saw flashes of brilliance. DJay’s mousey girlfriend sings “You know it’s hard out here for a pimp” with just the right mix of sultry and strong. Then she smiles in amazement at her own voice; she can’t believe she herself really sang it. It’s 30 seconds of great film. In another scene, she speaks some chilling lines of dialogue describing her nightmares about her pregnancy. The dreams are organic and disturbing, and more importantly, plausible. It’s very astute screenwriting, particularly from a male screenwriter. And luckily for the movie, the tracks that DJay and Key produce are actually pretty catchy. I have to admit that they stuck with me long after the movie was over. So Hustle & Flow earns a recommendation, not because it completely won me over, but because the little flashes of brilliance weren’t offset by disappointments. Clearly, Craig Brewer is a filmmaker to watch.